Please let us know any news stories from your country /association – use the "contact us" tab. Findings of research into teacher training for psychology was presented at the British Psychological Society conference in Glasgow on 5th May 2011. The EFPTA research team comprises Renate Schrempf (Germany), Dorothy Coombs (England), Morag Williamson (Scotland) and Lenka Sokolová (Slovakia). Since 2009 they have conducted research into various aspects of psychology education (PTPE) in Europe, including curriculum and assessment of psychology courses in eight countries where psychology is taught at secondary school level. The latest stage of EFPTA research - a qualitative study of training and professional development for psychology teachers - was showcased at the BPS 2011 Annual Conference, which is the biggest UK event for psychologists. 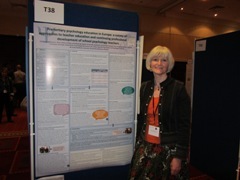 Morag Williamson (pictured) presented the research poster to a range of delegates from different psychology professions and various countries. Find details of the research and download the poster here . The conference also, for the first time, featured a number of sessions of relevance to PTPE teachers, and provided these at modest fees for teachers, as well as scheduling the sessions to fit in with teaching commitments. "This support for PTPE from a national psychologists' association - BPS - is very welcome", commented Morag. 10th ANNIVERSARY CONFERENCE REPORT: Sowing the seeds of psychological literacy - a conference for psychology teachers in Europe. Berlin, 11-13 April 2014. Slovakia: new psychology teachers' association and conference! EFPTA Conference - Copenhagen, 20-21 April 2012 - this event has now taken place. Reports will be available soon in the 2012 edition of the EFPTA Newsletter. Calling all psychology teachers and students - collaborative research project opportunity!